K-Form is a simple to use shuttering system that can be laid by just one person. As it is made from durable UPVC there is no heavy lifting and no associated health and safety issues. The 3 metre beams can be cut quickly to length with a hand saw and no specialist equipment is needed. 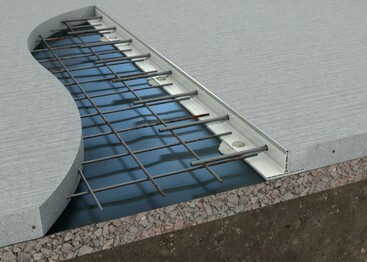 Made from 100% recycled materials, K-FORM is lightweight, durable and does not require removal after placement of concrete, thus ensuring a time saving solution by skipping the removable, cleaning and storing process. K-FORM UPVC Screed Railing provides theconstruction industry with an economical, efficientand environmentally friendly alternative to steel andtimber formwork.